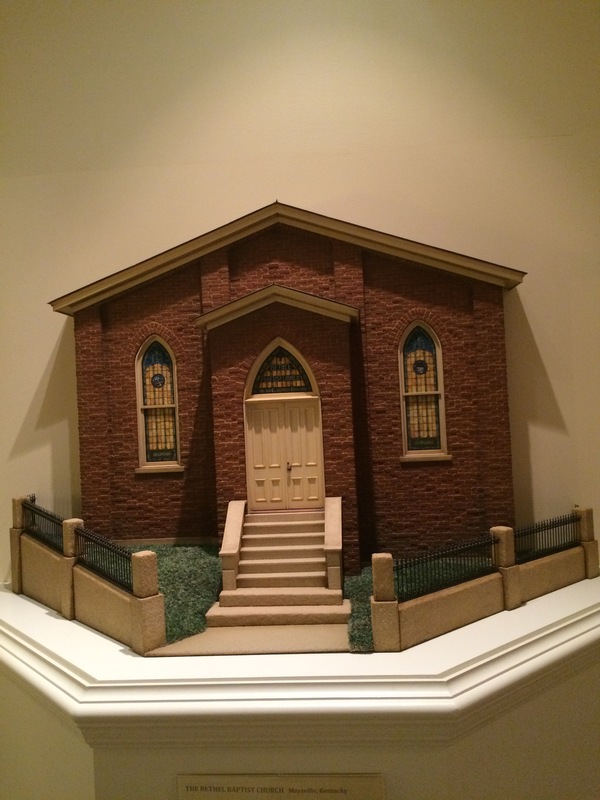 Four thousand hand-cut 1/12-scale bricks were used to create the exterior of the Bethel Baptist Church miniature. It took Allison Ashby and Steve Jedd 10 years to complete the miniature. This month marks a special moment in my quest to preserve the historic structures of my hometown in miniature. 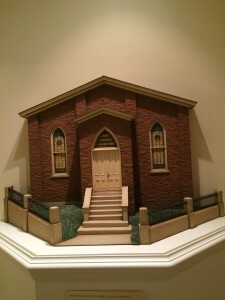 The completion of the Bethel Baptist Church is finally finished and has taken its rightful place alongside Maysville’s other important 1/12-scale landmarks: the iconic Russell Theatre and the Cox Building which housed everything over the years from the post office to a piano studio (I took lessons there from Helen Greim) to the beloved Kilgus’ Drug Store. You’ve heard my stories about both of those buildings. As a child I lived in downtown Maysville right across the street from the theater and in close proximity to the Cox Building. My neighborhood playground included the people and places of bustling Maysville during the fifties and all the shop owners knew the little blonde girl who left her roller skates at the door before entering. They would often see me hauling coat hangers from my dad’s white doctor coats back to Groce Dry Cleaners (also in the Cox Building) where I would fetch a penny per hanger and promptly proceed to Kilgus’ to buy a fountain Coke. Those were glory days in Maysville when the brick-lined streets were filled with shoppers and the stores stayed open on Friday nights to accommodate those who traveled here to buy goods or go to the theater. But it was also a time when segregation existed. The Bethel Baptist Church was up the street from our house and I remember passing it on our way home from our own Sunday services. The African-American community would gather in front of the church after worship—the women in colorful finery with glorious hats, the gentlemen in suits. You could see the joy on their faces as they socialized in the wrought iron and concrete contained church yard, either parting ways until the following week or waiting for the potluck dinner downstairs in the fellowship hall to begin. The interior of the church that served the African-American community for 100 years before the building was destroyed by fire in 1977. While I may not have understood it then, I’m sure much of their celebration stemmed from the very existence of the church, which according to the Kentucky Gateway Museum Center dates to 1844 when a slave named Elisha Winfield Green received permission from the First Baptist Church in Mason County to organize the Bethel Baptist Church. They allowed him to begin preaching at the church one year later and in 1848 a group of white men from the First Baptist Church loaned Green $850 so he could secure freedom for himself and his family. In 1875, Green and his congregation built the West 4th Street brick structure that would house the Bethel Baptist Church for a century. Green would serve as pastor there for more than fifty years and went on to found two more local chapels for African-Americans: the Mount Zion Baptist Church in Flemingsburg and the First Baptist Church in Paris. His service to the black community continued throughout his life in politics and education, as well. It was 1977 when the Bethel Baptist Church burned to the ground. It was ruled as arson. I was not a member of the congregation, but I felt the tremendous loss and I cannot to this day imagine how the church members must have felt. Within a year they had a new location on Forest Avenue in the old elementary school, but I never forgot how full of life the church was at its original site. Perhaps that is another reason I was determined it would be created in miniature—as a tribute to Maysville’s history and to its black community. When we were planning the KSB Miniatures Collection for the museum ten years ago, the Bethel Baptist Church was among my first commissions. Along with the Cox Building and the Russell Theatre, my intent was to preserve Maysville’s history in miniature for generations to see. I enlisted Steve Jedd and Allison Ashby to create the work in 2005 and when the collection premiered in 2007, the unfinished exterior and interior of the church were installed for the opening. Last month Steve and Allison completed the interior lighting, installed the stained glass windows, and finished the grass and wrought iron railing on the fence. When I saw the finished piece I was taken back to the joyous Sunday scenes I witnessed before the building perished. 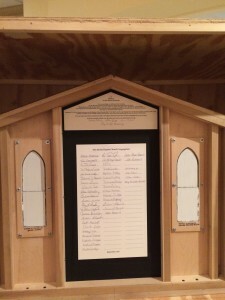 Behind the miniature are the names of past and present members of the congregation. Looking into the interior of the church miniature is a rare glimpse into the courageous history of Green and his congregation. 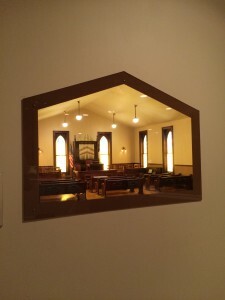 The beautiful simplicity of the room and wooden pews is awe-inspiring. And the light shining through the incredible detail of the stained glass windows gives an ethereal ambiance to the piece that makes way for imagining the sights and sounds of the historic church. I can almost hear the pipe organ and see the tiny handheld paper fans in motion cooling members of the congregation on a sweltering summer day. I am truly honored to be able to provide a way to celebrate a portion of the history of our black community in Maysville and to be able to do it by way of a church that touched my life and helped shape who I am. My hope is that viewers of the exhibit will feel the love that went into the research, planning, and building of the miniature Bethel Baptist Church to make sure that every detail was historically correct. 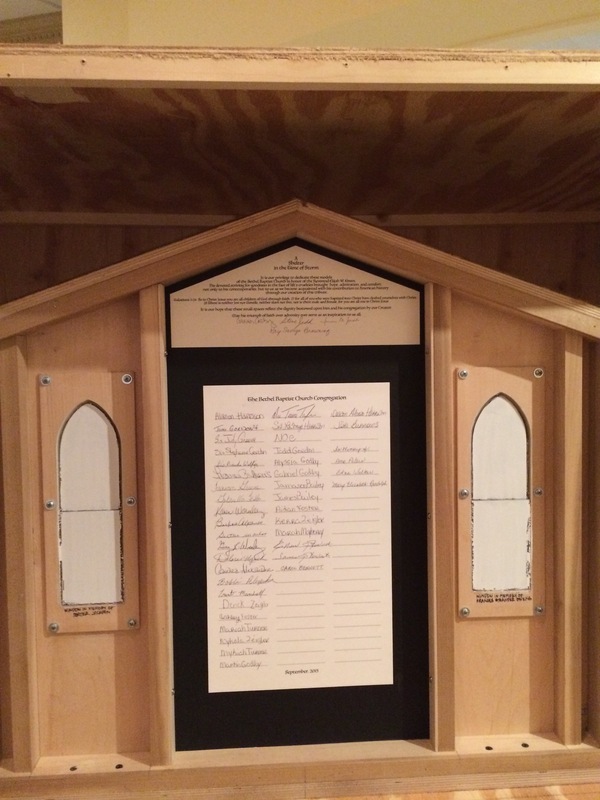 Before it was installed, we contacted the current pastor of the church to arrange to have all of the present members and names of the past members to be signed on the back of the center panel so those names would be there for posterity. This miniature is dedicated to all of those members, past and present. I bow to their amazing grace.